CDR Group has teamed-up with Hope Digital to provide a new service that delivers site-centred Ordnance Survey laminated maps. You can specify the location of anywhere in Great Britain to centre a customised map at a range of 5 scales to suit your own needs. Not only will it be printed to your area of interest – it will be laminated in the all-weather Aqua3™ coating. With Aqua3™ you can still fold the map without the lamination cracking, it is tearproof, it is lightweight and you can use marker pens that will wipe off it. Aqua3™ is the first site centred map to include magnetic data provided by the British Geological Survey. If you're a keen walker, horserider or organisation based in any outdoor activity, take a closer look. 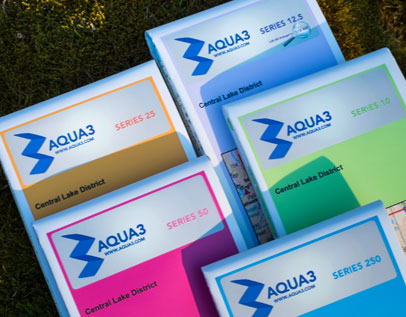 The benefits of using Aqua3™ are that all maps are printed using UV inks. The papers used are synthetic so are less affected by water and over-laminated to protect the print. Available folded or flat for wall use, the choice is yours. There is also the option of a larger sized map - Standard maps have 8 panels but you have the choice to add an extra 2 panels giving you an extra wide 10 panel map. ** NEW ** Strip map formats available for linear routes and features. All of the Ordnance Survey mapping used is the latest up-to-date data provided under licence. Published by Hope Digital, Parsons Lane, Hope, Hope Valley, S33 6RB.